Wisconsin Sports Tap: Simply the Best? The No. 4 Wisconsin Badgers couldn't have been more dominant. They couldn't have had a better showing on Senior Day and the couldn'y have dismantled a team more thoroughly then they did the Northwestern Wildcats on Saturday afternoon. Led by the indomitable J.J. Watt the Badgers scored points and style points on their way to their first Big Ten title since 1999. Watt forced two fumbles, blocked an extra point and hurried Northwestern's QB on two of the Badger's interceptions. With four Montee Ball rushing touchdowns and Aaron Henry's pick six and you have a Wisconsin team that nobody would want to face. - Senior Quarterback Scott Tolzien is the NCAA's fourth rated passer, behind only Boise State's Kellen Moore, Heisman front-runner Cam Newton and Ryan Mallett of Arkansas. - Tolzien also has the highest completion percentage of any D. 1 passer. - Ball, a third string running back, ran for 17 touchdowns - fourth in the NCAA. - Bucky's offense was the fourth highest scoring in the nation. In their last two home games Wisconsin scored 153 points. - How efficient has the offense been? Wisconsin punted only 35 times this year - less than three times a game. Only one major conference team punted less, Stanford with 29. - Lance Kendricks, the Badgers current in a long line of impressive tight ends, is the third highest receiving tight end in the country. - The Badgers had 46 rushing touchdowns this season, only one team had more (Nevada, 47). Best Bucky ever though? Could it really be possible? Many would point to the 1999 Badgers as the best, a team that featured a Heisman Trophy winner in Ron Dayne. They were also the last Big Ten team to win back-to-back Rose Bowls. That team featured a star running back, a breakout quarterback (Brooks Bollinger), an offensive line flanked by NFL draft picks Chris McIntosh and Mark Tauscher a shutdown corner in Jamar Fletcher. That team was good, so good they finished the season ranked No. 4. Others would point to the 1962 team, led by Wisconsin legend Pat Richter. The Badgers lost the Rose Bowl that year in a 42-37 decision against Southern California. That game marked the first time that the No. 1 team and No. 2 team faced each other in a bowl game. That season Bucky beat Notre Dame, No. 5 Minnesota, No. 1 Northwestern and saw quarterback Ron Vander Kellen lead the team to 23 fourth quarter points in their Rose Bowl appearance to nearly topple the nations top team. The 1993 team is another that deserves mention with this group. 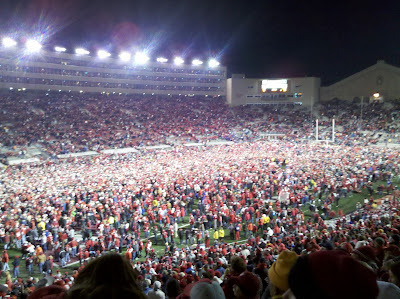 Those Badgers were a win against Minnesota away from a possible National Title. When Bucky lost at the Metrodome that year it was their first and only all season. That team had the best quarterback in Wisconsin history in Darrell Bevell and a pair of star running backs in Brent Moss and Terrell Fletcher. Despite finishing the season with a 9-1-1 record and Rose Bowl win they ranked only seventh in the nation. So where does this year's squad rank in the pantheon of great Badger teams? Are they the best? No, at least not yet. This is one of the most prolific teams that the Badgers have ever had and with a win in a BCS Bowl game, especially if it is over an undefeated TCU team, could change that. There is no team in the Nation that the Badgers wouldn't match up well against. Depending on the outcome of the Civil War (Oregon-Oregon State) and the SEC Championship (Auburn-South Carolina) next weekend the Badgers could see themselves vaulted into a National Title appearance. Although that outcome is very unlikely, what we do know is the Badgers could find themselves in nearly uncharted territory. A big win in a BCS game will seal the legacy of this team. But will it be as the best or just another heartbreaker that fell just short? Time will tell. But if I were an opposing coach, I wouldn't want to face Wisconsin.